Time to load up the jukebox! Katy Perry celebrated her 32nd birthday with a fun-filled 1950s-inspired party in Los Angeles on Saturday, October 29. The "Rise" singer, who officially turned 32 on October 25, was joined by her boyfriend, Orlando Bloom, and close pals Kate Hudson, Jessica Alba, stylist Jamie Schneider, jewelry designer Jennifer Meyer and more for the sock hop–theme celebration, which featured a pie-eating contest and a massive game of Twister on the dance floor. "It was insane," a source tells Us Weekly of the celebration. "There was a huge marching band at the valet. The whole place was decked out as Hudson High. The evening started with drinks in an area that was converted into a diner with pinball machines and &apos;50s waiters and diner tables. And then the band came in and marched upstairs, and guests went up to the main hall, where there was a cafeteria serving lunch food." 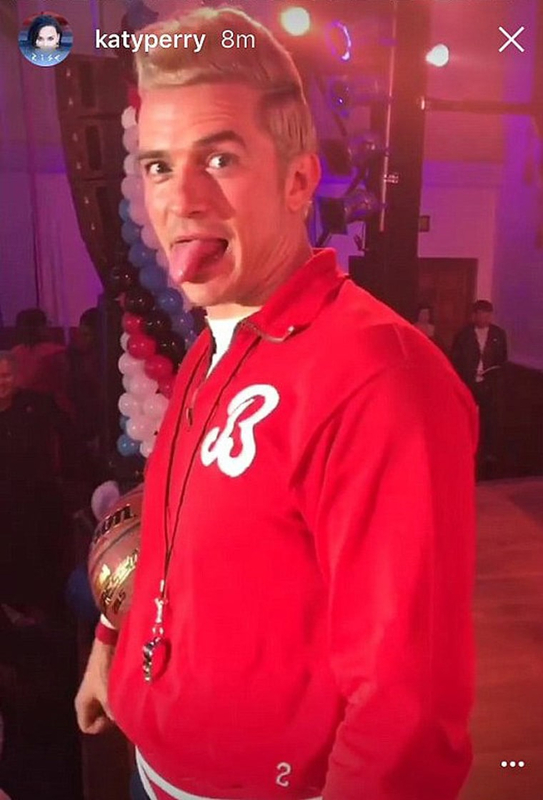 The birthday girl&apos;s beau, Bloom, 39, also got into the sock-hop spirit, dressing as a jock in a red bomber jacket and black short shorts with a whistle around his neck. And at one point, Perry could be seen dragging her beau off the stage as he got a little too close to a Marilyn Monroe impersonator. Principal @katyperry keeping #hudsonhigh student jock @orlandobloom in line at the school dance ??? "Katy and Orlando were very coupley all night," the source tells Us. The venue was jam-packed with cheerleaders, pinball machines, a jukebox and an Elvis Presley impersonator. According to the insider, Perry officiated all of the games, which also included a Hula–Hoop contest. After the party, Perry took to Instagram to thank her sponsor, CoverGirl, for putting the celebration together. "Thanks @COVERGIRL for keeping everyone clean-cut and QT at Hudson High, Home of the Poodles. [Kisses], Principal Hudson."